"I wonder how many people will come out to see the Arlington Heights Bears?" -Chicago Mayor Richard J. Daley, reacting to George Halas' 1970's threat to move the team to a new stadium in Arlington Heights, IL. The complete renovation of Soldier Field was comleted in 21 months, and the total cost for the stadium and surrounding infrastructure was $587 million. 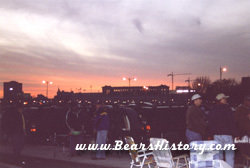 Criticism has flown since the redesign of the landmark structure, but Bear fans I talk to are glad to have a newer facility. Despite the improvements to the facility, the Bears' promise of a better bathroom situation did not happen in reality. Citing an ordinance as the reason, more women's bathrooms than men's were built in the new stadium. One problem: football games are predominantly attended by males. In 2003, this led to horrific lines at the men's restrooms, while the women's rooms were empty. In 2004 some women's restrooms were converted to men's, and the problem eased somewhat. Parking around the stadium remains a problem, perhaps a bigger problem than before, due to the large amount of greenery installed to replace asphalt around the new field. Official Site Soldier Field's website. Don't look for parking information. Figuring out where to cash park before games is simply a crapshoot once you get there.